Oumuamua, the first interstellar object observed by humans, may be more than just a space rock. Now, Harvard researchers claim that it may be an alien probe. A new study from Harvard discusses the possibility of Oumuamua being a probe sent by an alien civilization to spy on us. Well, the first extrasolar object detected in our solar system is still stirring controversy among the scientific community. Scientists said it could be an asteroid, a comet, a member of a whole new class of celestial objects. Now, a new scientific paper signed by two Harvard astronomers discusses another possibility. Oumuamua, in fact, could be not of natural origin but an alien aircraft. On October 19, 2017, the team at the Pan-STARRS1 Observatory in Hawaii spotted an interstellar object called A/2017 U1. The International Astronomical Union (IAU) then assigned the astronomical object its permanent designation of “1I/2017 U1”. This was a first in the history of IAU designations for astronomical objects, with the “I” in “1I/2017 U1” standing for “Interstellar”. Nicknamed “Oumuamua”, a Hawaiian word that roughly translates to “the messenger or scout from afar arriving first”, 1/2017 U1 is unlike any other known celestial object. Perhaps the only thing that scientists are dead sure about is that Oumuamua originated from interstellar space. Oumuamua was probably kicked out of its home planetary system and has since been roaming around for millions or even billions of years. It entered our solar system from above the system’s plane. Then, aided by the Sun’s gravity, made a sharp turn upward, in the direction of Pegasus constellation. Several hundred meters in length, Oumuamua has the properties of both comets and asteroids. However, it is also unlike any other object discovered in our solar system. The major oddity is its shape. It looks to be about 10 times longer than its width, giving it a very unusual elongated form. We don’t actually have any direct image of Oumumua and all the pictures of the cigar-shaped rock you see around the internet are artist illustrations. The second difference is its velocity. It’s too fast to be an asteroid or a comet from our solar system. Back in June, astronomers detected non-gravitational acceleration to ʻOumuamua’s trajectory, suggesting comet off-gassing as the reason. Comets, as they heat up from sunlight, can eject gases that give it an additional push. But this might not be the case of Oumuamua because astronomers observed no gas tail. The object also didn’t experience this kind of acceleration even when it was at its closest to the Sun. Could Oumuamua be an Alien Probe From Afar? For want of the slightest evidence of alien life, we sent a map indicating the location of Earth into space. Some scientists are mulling over the idea of setting up a giant laser beacon on the moon to guide alien scouts. But extraterrestrials may have already got wind of our existence, pinpointed Earth, and sent a probe for a closer look. They might have sent Oumuamua disguised as a wandering rock to spy on us up close and personal. Shmuel Bialy and Abraham Loeb, researchers at the Harvard Smithsonian Center for Astrophysics (CFA), reexamined Oumuamua data and published their results in a study in Astrophysical Journal Letters. The two researchers investigated the role of solar radiation in the unusual acceleration of Oumuamua. They found that Oumuamua’s mass-to-area ratio doesn’t quite add up. Researchers said that solar radiation could well cause non-gravitational acceleration. However, the small mass-to-area ratio of Oumuamua challenge that hypothesis. Such celestial bodies with such peculiar shapes, velocity, and mass-to-area ratio don’t exist in nature as far as astrophysicists know. And that opens the way to another explanation, or speculation, that Oumuamua could be an artificial “lightsail”. 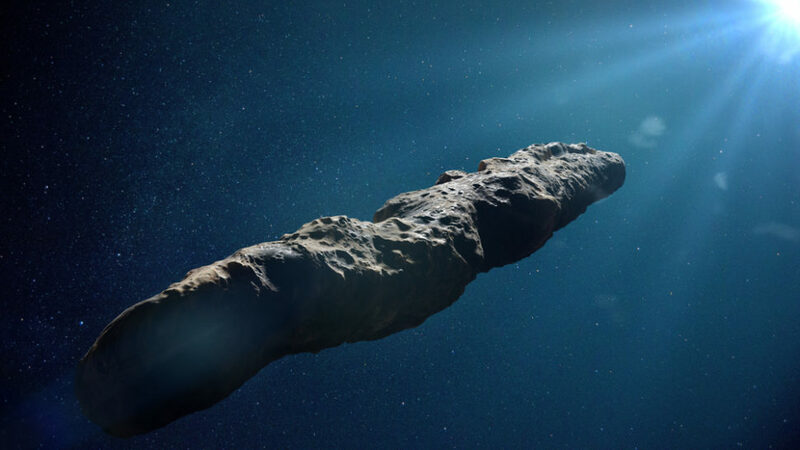 Some argued that Oumuamua emitted no artificial signals and criticized the authors of the study for jumping to conclusions. As strongly as we want it to be the case, this is definitely not solid evidence of intelligent extraterrestrial life. But it’s also worth discussing why, in centuries of modern astronomy, Oumuamua is the first visitor from interstellar space. Now, it may be too late to send a probe to see if Oumuamua is an “alien probe”, even for Elon Musk. Why would an alien civilization send a “rocky” probe all the way to our solar system to spy on us?